The floating wind turbine is located off the coat of Japan’s Fukushima Prefecture. The world’s largest floating offshore wind turbine was anchored by the Fukushima Offshore Wind Consortium and is located approximately 12 miles off the cost of Fukushima, a region of Japan that is known for the 2011 nuclear plant disaster that resulted after a powerful earthquake and tsunami tore through the area. The massive wind generating structure is 344 feet high and is said to be able to withstand mammoth waves, including tsunamis. 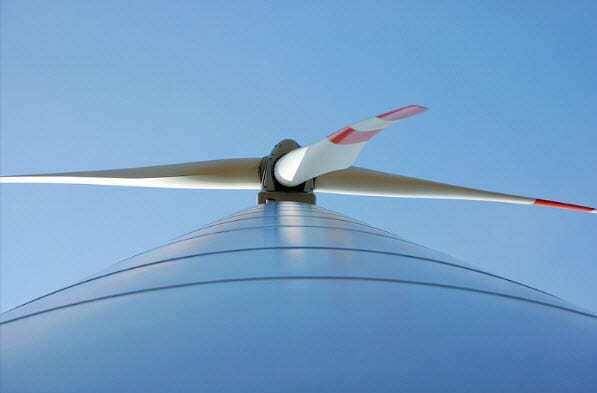 The turbine has been built to withstand 65-foot waves. The 344-foot 7 MW (megawatt) Offshore Hydraulic Drive Turbine features a rotor diameter of 538 feet and three giant blades, each stretching 262 feet in length. The structure is fastened to the seabed by four 20-ton anchors, and loose chains connect the turbine to the seabed, fortifying it against large waves. The consortium purposely designed the structures to be able to withstand the fierce and unforgiving weather native to Japan’s waters. In fact, this problematic weather even caused issues during the construction of the turbine. Installations had to be reportedly put on hold on four separate occasions because of typhoons. The offshore wind turbine is one of three planed for the area. The Fukushima Offshore Wind Consortium is led by Marubeni Corporation and also involves nine other firms, such as Mitsubishi Heavy Industries, which was the company that supplied the turbine. The $401 million project is funded by Japan’s Ministry of Economy, and was created for the purpose of developing and testing the wind technology for additional commercialization, and to bring new industry to the Fukushima region of Japan that was devastated by the earthquake in 2011. The 7 MW offshore wind turbine is one of three turbines planned for the facility. When the final turbine is installed later this year, the three turbines are expected to generate a combined total of 14 MW.